Francis Foord-Brown opened with a raise to 80,000 holding :::Ks:::Kd. 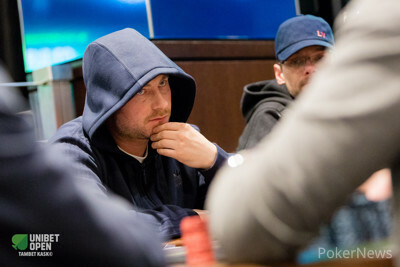 Martin Gallagher went all-in on the button for 450,000 with :::Jd:::Jh. Gerret Van Lancker picked up :::7d:::7h in the big blind and called the shove, but folded when Foord-Brown went all-in over the top.